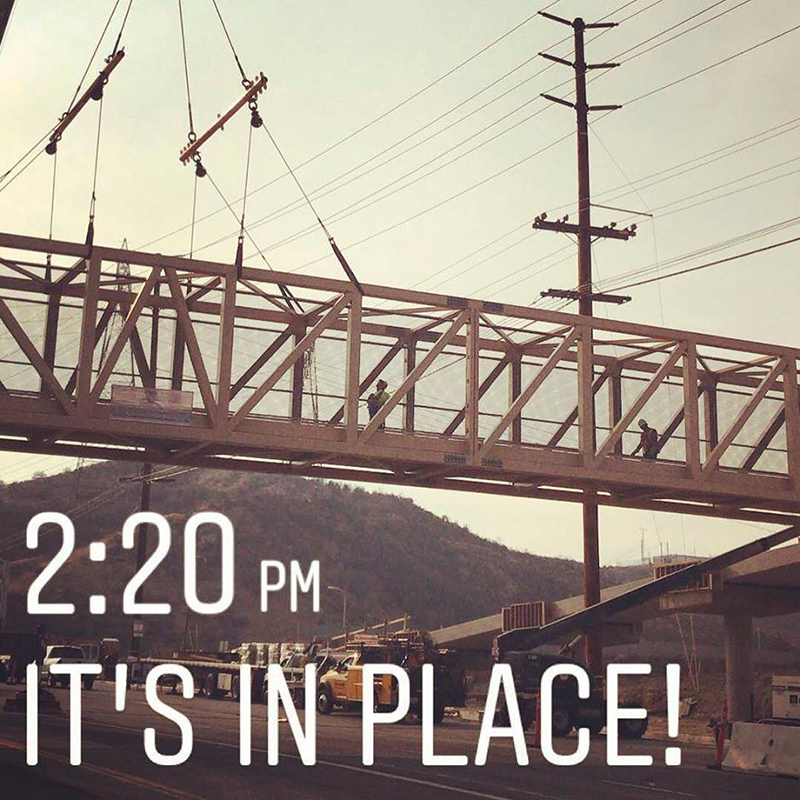 SCVHistory.com LW3438 | Newhall | Video: Pedestrian Bridge Erected Over Sierra Highway, 2018. 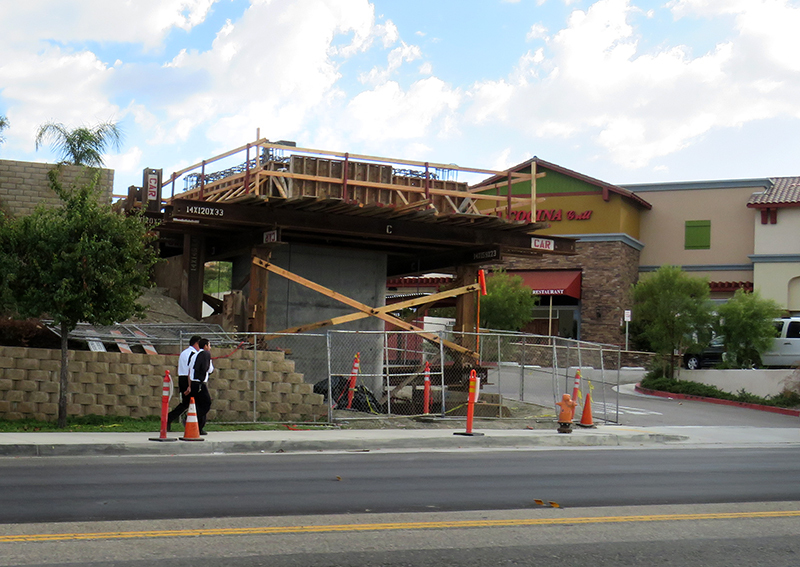 November 10, 2018 — Pedestrian bridge under is erected over Sierra Highway on the east side of Golden Valley Road. C.A. Rasmussen Inc. in 1979. 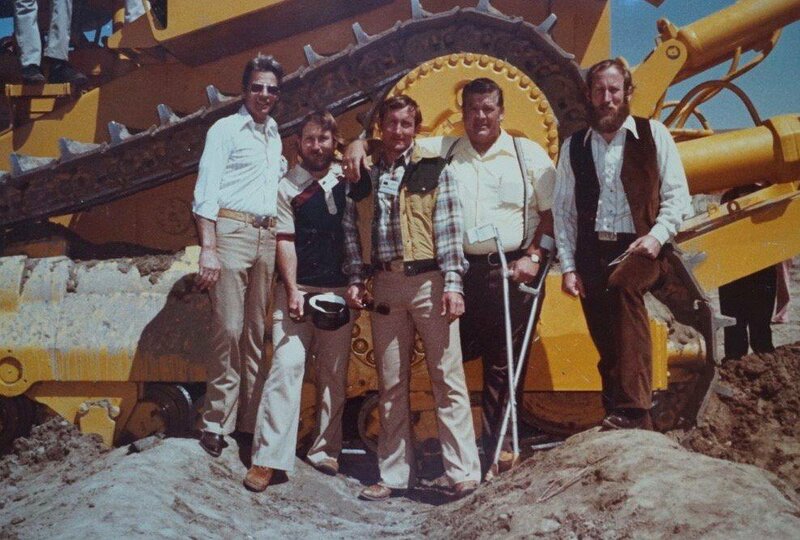 From left: Company superintendent Leo Blair, Charlie Rasmussen, Larry Rasmussen, a representative from P.W. Gillibrand, and Dean Rasmussen. Click to enlarge. 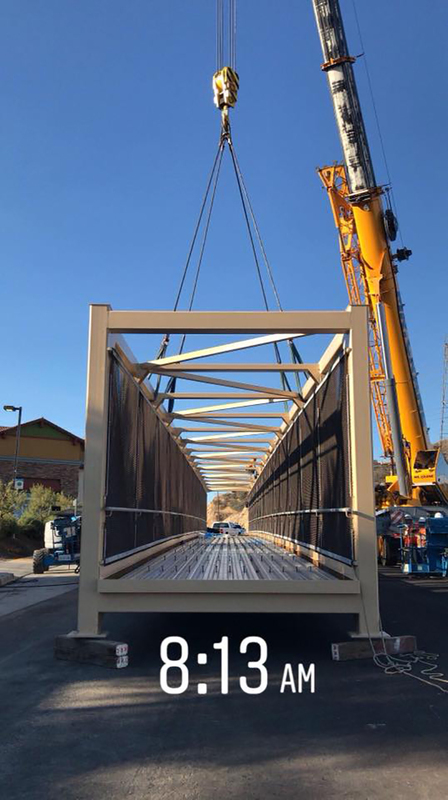 The pre-manufactured, 151-foot-long bridge was built in sections by Stinger Bridge & Iron in Coolidge, Arizona, and trucked to Santa Clarita where it was assembled on the ground and hoisted with a 270-ton crane atop the bridge abutments by C.A. Rasmussen Inc. on Saturday, November 10, 2018, starting at 12:01 a.m.
C.A. 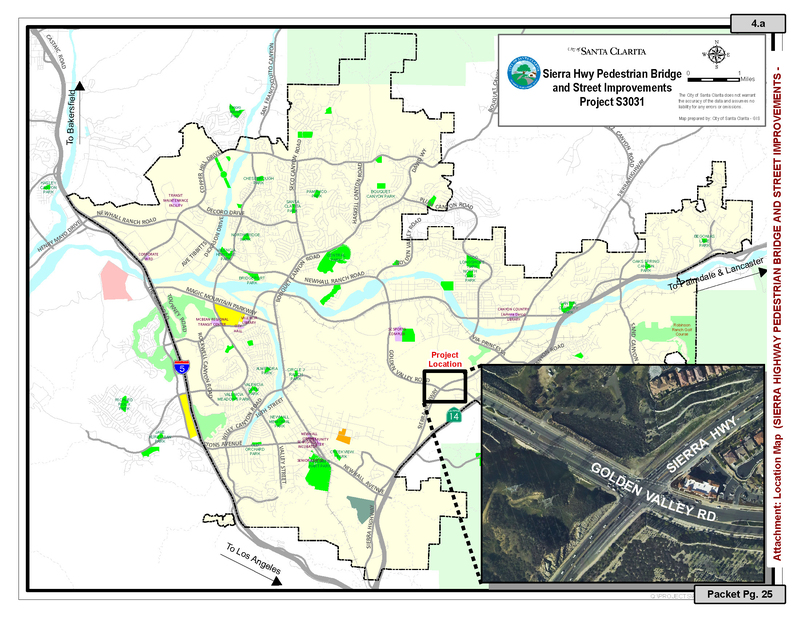 Rasmussen built the access ramps and performed the improvements along Sierra Highway under a $3,477,652 contract approved by the Santa Clarita City Council on September 26, 2017. Rasmussen was the lowest responsive bidder. Funding comes from a combination of city developer fees and a state grant — effectively splitting the cost 50-50 between the city and state. See council agenda item at bottom. 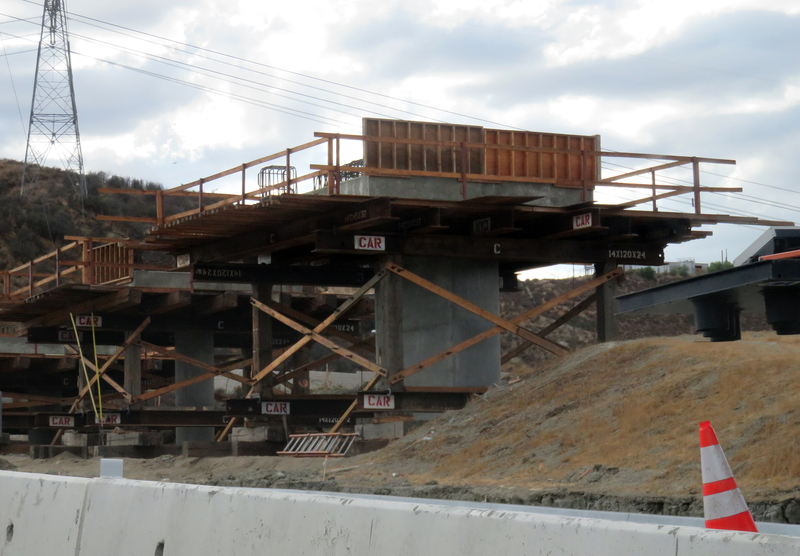 The project is performed with both city and Caltrans oversight. The section of Sierra Highway from Newhall Avenue to Friendly Valley Parkway (by some accounts, to Whispering Leaves Drive) is still state highway with the designation "SR-14U," where "U" stands for "unrelinquished." At one time, much of Sierra Highway was designated State Route 14. As the Antelope Valley Freeway was built in sections in the 1960s and 1970s, the designation was transfered to the new freeway, and ownership and responsibility for Sierra Highway transfered to the local government (county, then city) — all but the small section of Sierra Highway at issue here, which the state retained. 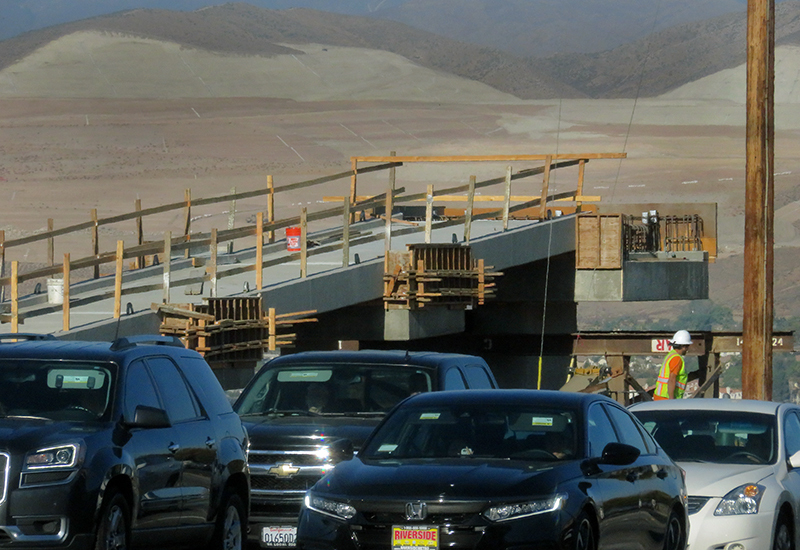 Under legislation by Assemblyman Dante Acosta and state Sen. Scott Wilk in 2017, the state agreed to transfer the highway section to the city of Santa Clarita but left the timing to local officials. According to city Public Works Director Robert Newman, certain improvements needed to be made to bring the road up to code before the city could accept it. 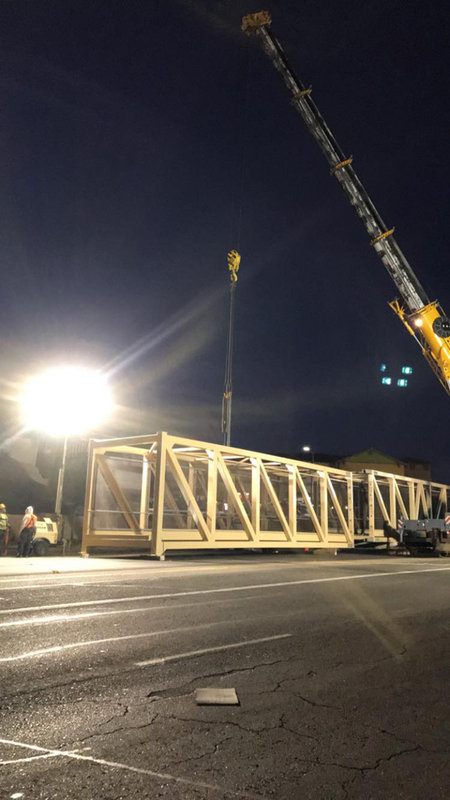 The pedestrian bridge is one component of those improvements. Read more. Photos below in chronological order. October 12, 2018. Click image to enlarge. October 12, 2018. Click images to enlarge. Installation Saturday, November 10, 2018. Photo courtesy of Stacey Klein Huerta/C.A. Rasmussen Inc.
LW3438: 9600 dpi jpegs from digital images by Leon Worden except as noted.